Candi Reasinger of McHenry buys two scratch off lottery tickets at the Mech Mart Marathon in McHenry after a check presentation for Reasinger at the gas station Friday, August 1, 2014. 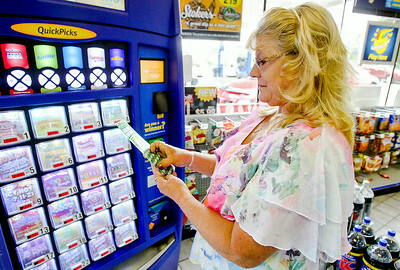 In June Reasinger won $1 million on a scratch off ticket, a presentation was held in her honor at the gas station where she bought the winning ticket. She has since retired and is looking into moving to Florida.